Reading progress update: I've read 50 out of 410 pages. Oh, wow, politics and an invasion of dark forces over Lancre!!! ‘Everyone will know in twenty minutes, Nanny,’ said Verence smoothly. ‘But none of them object to me,’ said Nanny. Verence turned. He was finding this disconcerting. 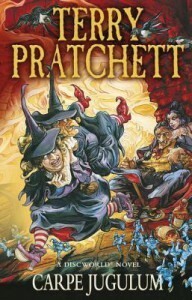 He knew Nanny Ogg very well, but mainly as the person standing just behind Granny Weatherwax and smiling a lot. It was hard to deal with an angry Ogg. ‘I really think you’re taking this too much to heart, Mrs Ogg,’ he said. ‘Granny Weatherwax won’t like it!’ Nanny played the trump card. To her horror, it didn’t seem to have the desired effect. ‘Granny Weatherwax isn’t King, Mrs Ogg,’ said Verence. ‘And the world is changing. There is a new order. Once upon a time trolls were monsters that ate people but now, thanks to the endeavours of men, and of course trolls, of goodwill and peaceful intent, we get along very well and I hope we understand each other. This is no longer a time when little kingdoms need only worry about little concerns. This seems rather dark and I am really enjoying this aspect. Also, can I just mention how much it cracks me up when Nigel Planer performs Verence in the style of Prince Charles?